Home / Posts Tagged "cyber dangers"
Premera hack puts renewed focus on securing sensitive healthcare info. As Tuesday’s news about the Premera Blue Cross hack shows, healthcare organizations are vulnerable to cyberattacks, and the fix can be costly. Already, at least two class action lawsuits have been brought against insurer Anthem, which saw a major data breach in January affect 80 million people. There’s also the cost to the health plan’s reputation and the logistics of notifying 80 million customers, Ponemon said. It’s still unknown what will come after 11 million people’s information was accesed in the Premera hack. Until Anthem’s hack in January, high profile security breaches focused on large retailers such as Target and Home Depot. This doesn’t mean healthcare organizations have been sitting on their hands believing it can’t happen to them, Ponemon said. A survey of 91 healthcare organizations in 2013 showed that 90 percent experienced at least one data breach that year. “Even if a hospital is reasonably secure, if may not be enough in this world,” he said. Medical records are extremely valuable on the black market, Ponemon said. They contain Social Security numbers, health ID numbers, addresses and possibly credit or debit card information – everything needed to create a fake identity. “Basically it’s a rich data source for bad guys,” he said, such as terrorists seeking travel credentials. The hackers may wait months and years before exploiting the data, he said. Ponemon was in the intelligence field for 45 years prior to founding the Ponemon Institute 14 years ago. HITRUST, the Health Information Trust Alliance, works with healthcare organizations to improve their data security. It has partnered with the U.S. Department of Health and Human Services to conduct monthly briefings on cyber threats relevant to the healthcare industry, and to share best practices for defense and response. HITRUST offers healthcare organizations a cyber threat alerting system of threats targeted at the industry. The C3 Alert is coordinated with the Healthcare and Public Health Sector and Government Coordinating Councils, according to HITRUST chief executive and founder Daniel Nutkis. As most security breaches are due to human error, maintain a good data structure to prevent data leakage, Ponemon said. Encrypt data. The Wall Street Journal reported Anthem did not encrypt the personal data of its customers. Ban the use of personal devices for storing patient information. Some doctors routinely send clinical records through personal e-mail, their own smartphones or tablets. Rent a network intelligence system instead of buying one, Ponemon advises. It’s secure. Collaborate with partners on exchanging information during and after a cyberattack, according to the National Institute of Standards and Technology’s 2014 “Draft Guide to Cyber Threat Information Sharing.” While this may seem counter-intuitive, providers need to learn the types of systems and information being targeted and the techniques used to gain access. Use standard data formats to facilitate interoperability and fast information exchanges, the NIST recommends. In order to protect your kids, as a parent, you should know how to keep your children safe on the Internet. Here the following are cyber facts and tips for parents and childcare givers to help keep your children surf serious, surf smart and surf safe.In order to protect your kids, as a parent, you should know how to keep your children safe on the Internet. Here the following are cyber facts and tips for parents and childcare givers to help keep your children surf serious, surf smart and surf safe. Keeping kids from visiting inappropriate websites and ensuring their use of appropriate monitored chatrooms with SurveilStar Parental Control Software – web based Internet monitoring software. Keep parental control over child’s safety and online activity. Ensure Internet safety for kids & teens and prevent them from Internet dangers. 1. Educate children to be “Internet Safe Kids” by making sure they use safe internet practices at all times, especially when using chat rooms, instant messaging and social networks such as Facebook, as these are the most popular and the most dangerous for our kids. 2. Set boundaries for your kids’ computer and internet use. Stress to your child never accept unsolicited email, files, photographs, videos or attachments from online strangers. 3. Along with education is just as importantly to monitor your child’s internet use at all times. Parental Control Software gives your kids the freedom to use the internet, at the same time flagging any behavior you feel is inappropriate. SurveilStar Any Parental Control is designed for parents to monitor kids’ online activity. With this software, parents can grabs screenshots, record sent and received mails, record chatting messages, monitor and record visited websites. So parents shield your children from cyber bullies, predators and adult oriented websites, and ensure you have the control you need over children online activity. The goal of parental control software is not to violate your children’s right to interact with their friends but to learn of any problems early so they can be dealt with quickly before any real harm can come to your child. After parents have learnt the cyber safety facts and tips, they must believe that it is necessary to install a parental control software on their local computer for protecting kids from cyber dangers. 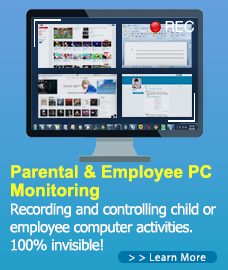 SurveilStar Parental Control Software is an ultimate invisible and undetectable easy-to-use activity monitoring and surveillance tool (surveillance software) for individual PCs. Focus on monitoring visited websites, received and sent emails, instant messages and transferred files let you keep an eye on your children online activities.